There are certain things that simply don’t cook properly in standard ovens. Pizza is among these things. To make a really good pizza, you want to cook it in a wood burning oven, for the classic, rustic flavor. Now, imagine being able to achieve that flavor anywhere you want, whether it’s in your backyard or on a camping trip. If you’re looking for convenience with style and flavor, an outdoor pizza oven may be the right choice for you. Many cooking appliances are used in your standard kitchen, like microwaves or toaster ovens. While you may consider these products portable, a portable pizza oven does not fit into this category. The main difference with a portable pizza oven is that it is meant to be used outside. This can open up a whole new set of options for you. You can entertain friends and family outside in your front or backyard, or you can even head to the beach or camping with your outdoor pizza oven. The best type of oven to make a pizza in is one that is wood burning. It creates the most authentic flavor for your pizza. 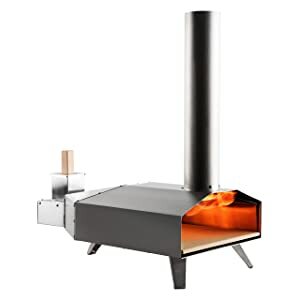 If you’re serious about the quality of the pizza you make and eat, then you want to search for a portable pizza oven that is wood burning. After reading the Roccbox review, you may feel that you have found the perfect portable pizza oven for you. Why Do I Want Portability? Having a portable pizza oven means that you have more options, it’s as simple as that. Just because it’s portable, does not mean that you need to move it around all the time. But think of it like this. If you have a pizza oven that is not portable, that means you choose one spot, and no matter what your pizza oven stays there. But what if you have a large yard for entertaining or you want to be able to take your pizza oven with you for outdoor trips? Portability means that you can move your pizza oven to a different spot in your backyard for a better view while the pizza’s cooking. And it also means, that you can have a pizza party on the beach if you choose. Having the option of portability will open you up to new and fun experiences that wouldn’t be possible with a standard pizza oven. If you have any experience trying to find ways to cook the perfect pizza, then you know that a pizza stone really helps. The pizza stone creates an atmosphere like a masonry oven, made of stone or brick, which is the ideal place to cook a pizza. 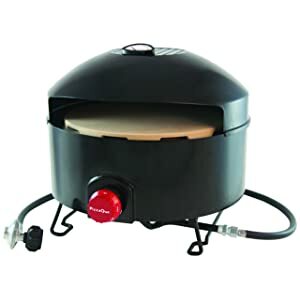 There are many portable pizza ovens available that include a pizza stone. This is a great choice for achieving the most delicious pizza. It also saves you the trouble of trying to find a separate pizza stone that fits properly in your portable oven! When searching for your portable pizza oven, it’s a good idea to look for products that reach high heats. With higher heat, you have the option to better control the texture of your pizza crust. You will more successfully create a desirable crispy crust when you cook your pizza at high heat. High temperatures also allow you to cook your pizza in a short amount of time. If you plan to entertain friends and family with a fun pizza night, this can come in handy! Not only is stainless steel sleek looking, but it is also an extremely durable material. The best portable pizza ovens are constructed with stainless steel as their main material. Stainless steel also aids in the fast and high-heat cooking of your pizzas. The stainless steel inside the ovens reflects the heat so that pizzas are cooked evenly throughout. There are many designs and types of portable pizza ovens for you to choose from. They all offer unique features. It is up to you to determine what features will best suit your personal needs and lifestyle. Here is a list of the best 8 portable pizza ovens. Read over the descriptions and consider which one appeals most to you. The Roccbox portable pizza oven provides the best of all aspects of pizza ovens. With both wood burning and gas burning options, you can use this oven to cook a variety of dishes. It s sleek design is pleasing to the eye while remaining lightweight enough for practical portability. With a weight of around 20kg, it is light enough to be carried and moved by one person, for easy transport or position changes. Silicone jacket that can withstand high heat, provides protection by covering the outside of the oven, which is very hot so that it remains safe around your whole family. Options to use either its wood burner or gas burner for more flexibility in what you cook. Cast stone floor acts as full-sized pizza stone for proper cooking. Constructed with multiple steel layers for durability and high-heat reflection and cooking. Easy to switch between wood and gas burners, without a hassle. Color-coded thermometer displays the oven’s temperature for better control and adjustment while cooking your pizza. Comes with restaurant quality pizza peel for easy maneuvering of your pizzas. Preheats to its highest heat within 15 minutes so that you’re ready to cook. Once the highest heat is reached, you can cook your pizza within 2 minutes. Not only for cooking pizza, as wood and gas burning options create ability to make many types of food. Pricey option that may not be feasible for everyone. Another wood burning option, the Uuni Pizza Oven provides a stylish oven for any setting you put it in. With its stainless steel construction and ability to reach high heats, you will be able to create the pizzas you’re imagining. Durable stainless steel construction provides quality that will stand the test of time. Very easy to assemble and can be done by one person in under 10 minutes. Preheats to full heat fast, in around 15 minutes, so that you can start making pizzas without waiting too long. Produces pizzas with noticeable and authentic wood fire flavor. Comes with one pizza peel so that you can put the pizzas in the oven and take them out seamlessly. Cooks pizzas in about one minute, depending on their size. Very easy to transport from place to place and there exists a traveling case specifically for this oven, which can be acquired separately. Easy to light the wooden pellets with a commonly used kitchen torch tool. Good option for those interested in Roccbox quality on a more affordable budget. There are videos available to watch online which help to better understand how to best operate the oven. Takes some time to get the hang of continuing to add wood pellets while simultaneously attending to your cooking pizzas. 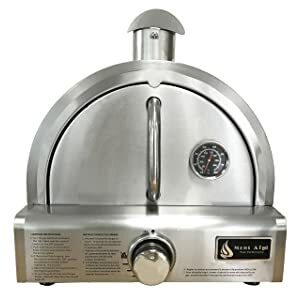 The Pizzacraft PizzaQue PC6500 Outdoor Pizza Oven is a great choice if you are interested in finding a quality portable propane pizza oven. Its small size creates ideal and easy portability without taking away from creating quality pizza efficiently. Reasonable price may make this portable pizza oven a more feasible option for a wider range of people. Easy to assemble, taking just a few minutes of one person’s time. Will not burn or scorch the surface that it sits on while it cooks. Preheats to its highest heat in about 15 minutes eliminating long waits before you start making your pizzas. Works well for cooking many other types of food, including meat. Pizzas cook fairly quickly and you will find that yours are ready within around 4-7 minutes. Comes with a storage cover which is waterproof and protects the oven well when not in use. Company provides responsive and helpful customer service. Does not have wood burning option. You will need to purchase a pizza peel separately for more ease and convenience. The Mont Alpi Table Top Gas Pizza Oven is a stylish addition to your cooking collection that will create tasty pizzas. You will find the Mont Alpi Pizza Oven to be durable and easy for anyone who’s interested to learn and operate. Very easy to clean with a slide-out tray in the bottom of the oven and an accessible inside. Constructed with all stainless steel making it very durable meaning that it will last a long time without wearing or becoming damaged. Compact size makes it great for easy transport and also for storage when not in use. Comes with a quality pizza stone for proper and thorough cooking of your pizzas. Works with propane and can also work with natural gas, if you’re interested, but propane use makes it more easily portable. Cooks pizzas well within about 3-4 minutes so no long waits to enjoy your creations. Comes with a temperature gauge that is visible on the outside of the oven so you can keep track of how hot your pizza oven gets. Also works well for cooking and roasting other foods besides pizza. Does not have insulation so the outside of the oven gets very hot, which means that you will need to be careful about touching it while it cooks, and be sure to supervise children or pets. The included pizza stone gets very hot and burns your pizza crust easily if you are not attentive enough. 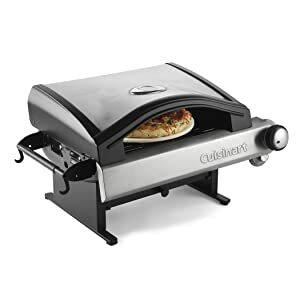 The Cuisinart Portable Outdoor Pizza Oven is an extremely compact and lightweight option that you can take with you to make pizzas wherever you desire. You will be able to create and cook your pizzas at high heat in a short amount of time for faster enjoyment. Works with propane so it is extremely easy to transport it and bring it with you wherever you go, even to the beach or for camping. Creates desirable pizzas that are chewy on the inside yet crunchy on the outside with good flavor. Has a small bowl inside where you can add wood chips for a more smoked flavor for your pizza. Solid and durable construction means that your pizza oven will last for a long time without incurring damage easily. Works well for cooking other foods besides pizza including breads and meats. There is a handle on the outside of the oven that you can use to lift the top so as not to get burned while cooking because the oven can get hot. Comes with a pizza peel and a pizza stone for convenient and proper cooking. You can buy, separately, a cover for the pizza oven which you will make good use of for storage when you’re not using the oven. Outside of the oven gets very hot so you need to think strategically about where you will place the oven if you do not purchase the separate stand. Instruction manual could be more helpful and provide specific tips for easier use. The Camp Chef Italia Artisan Pizza Oven is a compact and sleek looking option for making your pizzas. It comes with a ceramic pizza stone and cooks like a traditional wood burning oven for premium and enjoyable pizza flavors. More affordable option that will be feasible for a wider range of people. Can reach very high heats in order to create quality and crispy pizzas. Heats up fairly quickly so there is no need to wait too long before beginning to cook your pizzas. Very efficient and helpful customer service. Cooks pizzas very quickly and you can expect to be eating your creation within 2-4 minutes. You can add wood chips, if you like, for a smokier flavor to your pizzas. Can be used easily on top of your stove or even your grill. Reaches its top heat within about 15 minutes, and cools after quickly after you are finished using it. You will need to be very attentive and careful when cooking pizzas because the oven heats up very fast, and children and pets might be in danger if they touch it while hot. Does not have convenient carrying handles for easy transport and portability. With the Presto Rotating Oven, you can create your own tasty pizzas in a compact yet durable oven. Your pizzas will be cooked evenly with its rotating tray and you will find cleaning to be a cinch as the tray comes out and can be stored wherever you’d like. Very compact and can be left on your counter or stored easily when not in use. Baking tray rotates continuously to ensure even cooking of your pizzas. Very simple to clean as it is an open oven and the tray can just be wiped down. 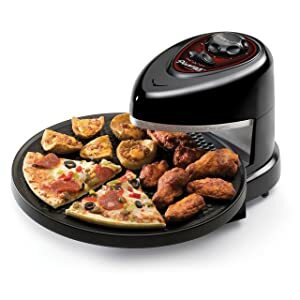 Works really well to quickly heat up many types of foods, in addition to cooking delicious pizzas. Very affordable option for making pizzas, that will be feasible for most people. Tray is a good size and you will be able to make 12-inch pizzas if you’d like. There is no preheating necessary as it becomes hot enough to start cooking as soon as it is turned on. Works with electricity so no need to bring or purchase wood or propane when you bring it to other places such as camping sites. It’s an open oven where the cooking tray is always exposed and very hot when working which means that you need to take extra care to protect yourself, children, and pets as it works. Cooking tray can become wobbly or uneven if weight is not balanced properly, which could lead to the tray tipping over and food falling off. 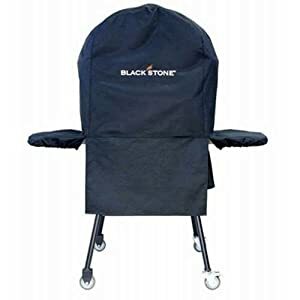 The Blackstone Outdoor Pizza Oven provides you with a battery-operated option for portable pizza making. You will be able to cook larger sized pizza in a short amount of time for enjoyment in many places like your backyard, the beach, or camping sites. Company provides helpful and responsive customer service. Comes with a baking stone for proper cooking of your pizzas. Cooks pizzas quickly and you and your friends and family will be eating within 2-3 minutes. Can be operated with batteries making it the ultimate option for portability that you can bring virtually anywhere you’d like without trouble for pizza making. Preheats to highest heat within 15 minutes so there is no long wait to your pizza making. Heated with propane which adds to its easy portability. You can buy a cover for the oven separately for better storage when not in use. Pricey option that won’t be feasible for all interested in portable pizza ovens. Instructions are not as clear or helpful as they could be in terms of helping with proper assembly and easing into use of the oven. After reviewing the features of the top 8 portable pizza ovens, it’s time for you to think about which one may work best for your lifestyle. 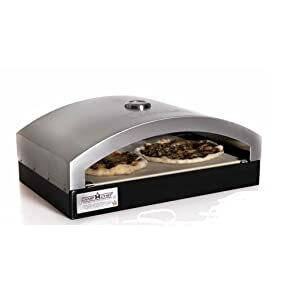 We recommend the Roccbox portable pizza oven because of its durable and sleek design, flexible wood or gas burning cooking options, restaurant quality pizza peel, and overall ease of functioning. If you feel that Roccbox is out of your budget or you are simply interested in another style of portable pizza oven, take the time to closely examine the other 7 options on this list. You are sure to find an outdoor pizza oven that will add fun and convenience to your life! We have tried Roccbox and love it. Best ever Portable Pizza Ovens. I currently use portable pizza oven Roccbox. It’s an amazing product. We can have a pizza party wherever we want.